KCDowntown wrote: On the upcoming PIEA schedule has an abatement request for 1717 Walnut, which is the building just north of the Walnut Terrace project that appears to be getting close to completion. Currently, there weren't any details as to what the plans are for the building. hmm... that's jones gallery. the gallery owner (same as building owner) must be selling? the lane and cityclub posts have been moved to their respective threads. There is an active commercial renovation permit for this building across from Mildred's on Wyandotte. This photo is a couple weeks old. Anyone heard what's going in it? Last edited by Critical_Mass on Wed Nov 15, 2017 5:06 pm, edited 1 time in total. i have, but i can't say. it's a relocation from within the crossroads. I see.... I'm gonna guess HighTower Group since Centric is moving out of the other half of their current building. That would free up that streetcar facing property for redevelopment. But again, I have no idea. The Firestone Bldg is up for auction in 9 days. Does the fact it is an auction imply anything, i.e. foreclosure? I hope it goes to a responsible owner with a vision for an office or residential conversion. No matter who picks it up, you'd think the Abdiana sign goes. A restoration of the original Firestone neon sign would be a dream come true. herc rentals has inquired about vacating 17th street between charlotte and holmes. the neighborhood is obviously opposed. Thanks Nigro, see what you've started? Critical_Mass wrote: The Firestone Bldg is up for auction in 9 days. Please let this building sell and get it out of the Abnos ownership hell. DaveKCMO wrote: herc rentals has inquired about vacating 17th street between charlotte and holmes. the neighborhood is obviously opposed. NO! Herc Rentals needs to be relocated. Having that type of use in that neighborhood is holding it back. This is what I've heard. East and West store permit at 1828 Grand...could it be this place? Stores in St. Louis and Tulsa, carries Baldwin jeans- I think that would be a safe bet to say that that is it. Hey what’s going on with the warehouse building across from the substation on 19th and Cherry? That’s a weird spot for a swanky event space. JBmidtown wrote: That’s a weird spot for a swanky event space. The Guild does pretty well down there - . Maybe not QUITE as swank as that new place, but still high end event space. Berg and Orange aren't too far from there either. Assurant sold one of their properties (2323 Grand) today to an investor from LA. 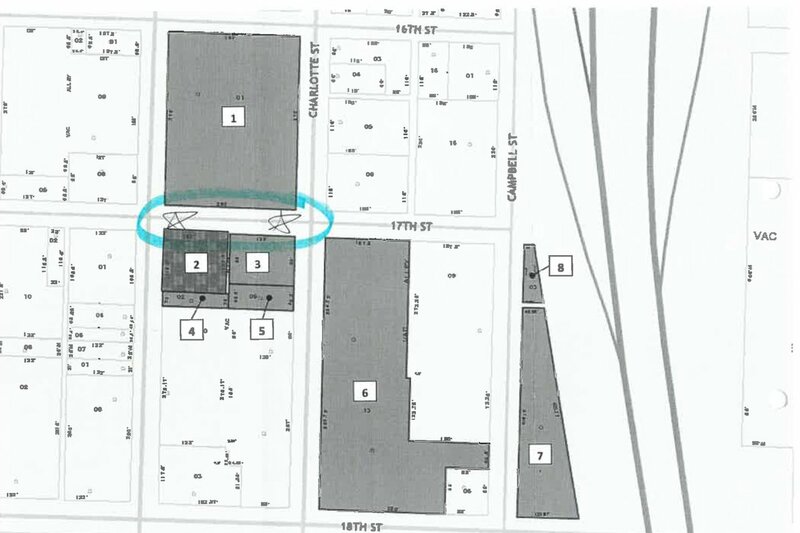 The building is located in CC, but I put it in this thread because the property was sold along with the surface parking lot between 19th and 20th along grand. As that is one of the major eyesores in the Xroads, a change in the ownership of that lot has huge potential for the area. Hopefully they will consider developing on it. Stanton Road Capital LLC is the purchaser if anyone wants to do some research for everyone to see what kind of properties they own and/or develop. It looks like most of their portfolio is office. They also own Plaza West (the Bernstein Rein HQ), which they purchased about a year ago. Coincidentally, I just brought this up in a different thread yesterday, but the garage for that building looks like it may have been designed to be built on. It looks like there is already an elevator shaft constructed that goes 4 stories above the top of the garage. I wonder if there are any plans there. There is also a good-sized vacant lot between the garage and the under construction Spring Hill Suites that is part of the same parcel as the tower and garage. kboish wrote: Assurant sold one of their properties (2323 Grand) today to an investor from LA. The building is located in CC, but I put it in this thread because the property was sold along with the surface parking lot between 19th and 20th along grand. As that is one of the major eyesores in the Xroads, a change in the ownership of that lot has huge potential for the area. Hopefully they will consider developing on it. Ironically I went to college with both of these guys. Unfortunately, they are more of the "sit on a property and generate good returns for their fund" type of firm.